Coffee-culture goes counterculture (Episodes are below) I love a freshly brewed coffee. I know you do too. You might buy one on the way to work, I like to have a lunchtime walk so that’s when I enjoy mine. But recently throwing away all these disposable cups has been bothering me. Every minute 500 coffee cups are thrown away in the UK – that is 2.5 billion cups a year! I’d like to do something about that and I thought Lent might be a good time to make a change. So I’m giving up on disposable cups and sharing the journey with you by making a podcast. I’m calling it #NoCupPlease. #NoCupPlease is a podcast experiment. I’m going to visit as many coffee shops as I can, both major chains and local coffee shops, and when I order I’m going to say something like, ‘Americano but #NoCupPlease’. I’ll record the experience as a podcast episode. 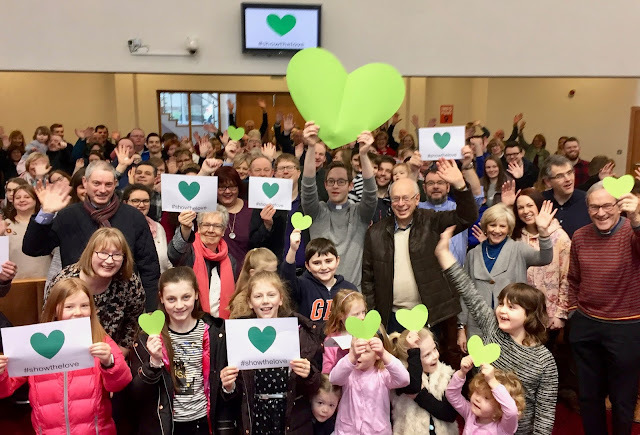 Members of St. Saviour’s Church Dollingstown in Magheralin Parish decided to ‘Show the Love’ on Sunday 11 February, just before Valentine’s Day, to raise awareness about how things we love might be affected by climate change. Whether it’s coffee, the Causeway coast, sea turtles, our grandchildren or the people of Kenya, we all love someone or something which will be affected by climate change. The changing climate is already taking a toll on vulnerable communities around the world causing, for example, drought and food shortages in East Africa and more extreme flooding and cyclones in Bangladesh. The ‘Show the Love’ campaign is organised by Christian Aid along with over 100 other organisations as part of The Climate Coalition. They call on individuals, schools, churches, clubs and societies across Ireland and the UK to ‘Show the Love’ for everything that is threatened by climate change.